25kg, 50kg in HDPE Poly laminated bags or as per customer requirements. Soyabean grits are used for making untoasted Soya Flour, soya milk, tofu, soya bean powder, Isolated Soya bean Protein. It is used in Dietetic Foods, Baby Foods/Drink Mixes. 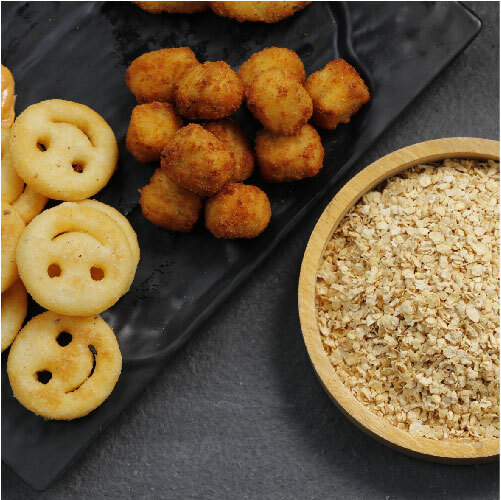 Soya bean grits can also be used in conjunction with other foods to add protein and texture to food items such as bread, cookies, and cereals. Soyabean grits can be used as a source of high protein ingredient in all classes of poultry, aqua, swine, and feed formulations. Widely used by poultry firms. Influences functioning of heart, lowers blood cholesterol, helps bowel movement in human body, reduces risks of cancer, and prevents breast cancer. Dietary fiber, Vitamin B and Omega 3- fatty acids. Soya Defatted Grits are produced by the process of cleaning, grading, destoning, dehulling, flaking and solvent extraction of ‘Non-GMO’ Soya bean seeds. After highly efficient extraction with hexane, the de-oiled flakes are desolventised through Flash Desolventisation System (FDS) without denaturing the protein, thereby maintaining high PDI value. The desired consistency of the product is obtained by sieving through the Gyro sieve.